2014 was the first year in which cases filed under this IPC section were included in the National Crime Records Bureau data. The police investigation against Amnesty International India – for slogans raised during an event the global advocacy organised – is the second sedition case registered by the police in Karnataka this year based on a complaint from the student wing of India’s ruling Bharatiya Janata Party. The police charged two students with sedition in the southern town of Tumakuru on March 30, 2016, after the Akhil Bharatiya Vidyarthi Parishad accused them of raising pro-Pakistan slogans while distributing pamphlets supporting Jawaharlal Nehru University Students’ Union president Kanhaiya Kumar, and Rohith Vemula, a Hyderabad University Dalit scholar who committed suicide. About 80 ABVP activists beat the two students with helmets and sticks, according to this India Today report. In the Amnesty case, a first-person account of the Broken Families event speaks of a “heated but not threatening” meeting with diverging viewpoints from Kashmiri Hindus and Muslims in the audience. As the audience dispersed, ABVP activists outside stepped in. “In slapping sedition charges, the police appear to have ceded to pressure from the large group of ABVP activists at the (police) station,” said Chandan Gowda, a sociology professor at Bengaluru’s Azim Premji University. For the first time ever, the National Crime Records Bureau included data on crimes related to the 156-year-old sedition law in 2014, the year the BJP came to power. Sedition is a new category (section 124-A of the Indian Penal Code) under a heading called "Offences Against the State". Karnataka registered no sedition case in 2014, although 47 such cases were filed across nine states that year, according to NCRB data. Jharkhand (18) and Bihar (16) registered the most sedition cases that year. In June 2016, Karnataka charged two organisers of a protest demanding better working conditions for the police with sedition. Three journalists were arrested and booked for sedition in Karnataka’s Belagavi on December 3, 2015. Source: National Crime Records Bureau; Note: Offences Against the State have been classified largely under two categories: offences against the state (under sections 121, 121A, 122, 123 & 124-A IPC) and offences promoting enmity between different groups (under sections 153A & 153 B IPC). “Offences Against the State” have been classified largely under two categories: offences against the state (under sections 121, 121A, 122, 123 & 124-A IPC) and offences promoting enmity between different groups (under sections 153A & 153 B IPC). 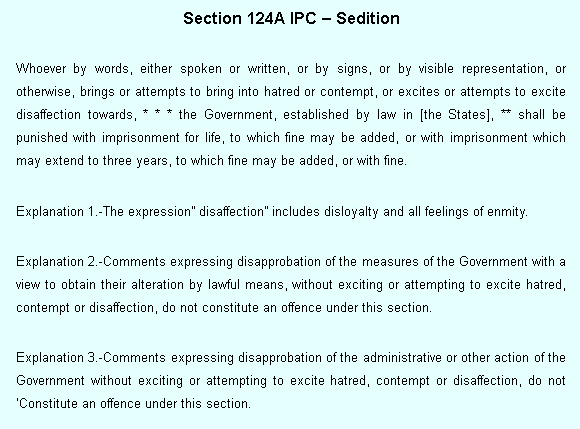 Sedition falls under section 124-A IPC (See Box Below), while sections 121, 121A, 122 & 123 constitute waging war or attempt/conspiring to wage war or collecting arms for this purpose, among other related crimes. India shares the sedition law – once used by the colonial administration to imprison Mahatma Gandhi in 1922 and Bal Gangadhar Tilak in 1987 and 1909 – with a variety of mostly authoritarian countries, such as Saudi Arabia, Malaysia, Iran, Uzbekistan, Sudan, Senegal and Turkey. The US also has a sedition law, but many parts have been struck down over two centuries. Others, such as the UK, Scotland, South Korea and Indonesia have done away with the law. As many as 58 people were arrested for sedition nationwide in 2014. Bihar had the most arrests (28), followed by Jharkhand (18), Kerala (4), and Odisha (4). 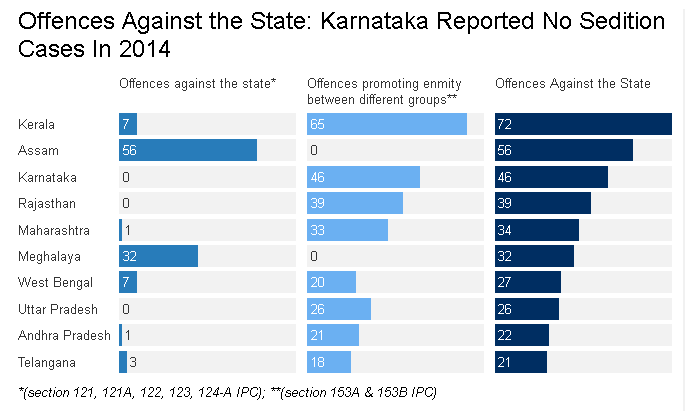 Karnataka often uses a law often used in conjunction with the sedition charge – ”promoting enmity between groups” – to deal with religious riots, which it experienced, per million population, more than any Indian state between 2010 and 2014, IndiaSpend reported in 2015. 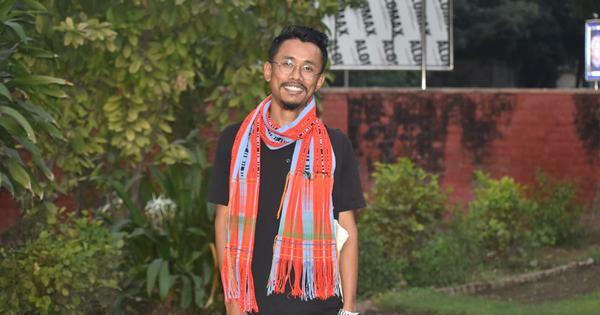 Apart from sedition, the promoting-enmity law was coupled, in the Amnesty case, with “rioting” and “unlawful assembly”, although the event was cleared by the police, which provided security. “The police were invited and (were) present at the event,” Aakar Patel, Amnesty India’s executive director said in a statement. The ABVP claimed the event supported terrorism. The Amnesty Event showcased the stories of three families who lost kin to action by security forces, including extra-judicial killings, for which six soldiers were court-martialled and imprisoned for life in 2015. The fracas began when the audience disagreed over the role of the army, with Kashmiri Muslims shouting freedom slogans in response to Kashmiri Hindus defending the army. Gowda said the home minister ought to have clarified that slogans alone do not constitute sedition. The Supreme Court has frequently clarified that words and speech, criticism or slogans, however distasteful, cannot be considered seditious unless they incite violence.